Okay, I want to know who is responsible for the calendar. I mean, who can I speak to about what is going on? I distinctly remember it being November just a few minutes ago, and now my calendar says it is December. How can I possibly get everything done that I want to do before Christmas? And why is it like this EVERY YEAR? I’m trying very hard to be selective about how I spend my time. I’m trying to eliminate excess stress by cutting back on my huge list of “things to do”, but there are so many things that I just can’t seem to drop. I shaved days off of my fruit cake baking schedule by eliminating 5 batches of cake. Of course now I feel obligated to make and send a lovely Christmas card to everyone who usually gets a cake. Then I should explain that they should not waste their time checking for a cake delivery . Perhaps I’ll send them the recipe instead. I’m trying to decorate the house so that it is festive and cheery without getting out every Christmas decoration I own, but even wading through and making choices is taking a considerable amount of time. I really do love to see the house all gussied up for the holidays, but does anyone else even notice? There should be a way to make it easier… besides leaving the country for 2 months. I do want to share one of my biggest time savers when it comes to decorating. 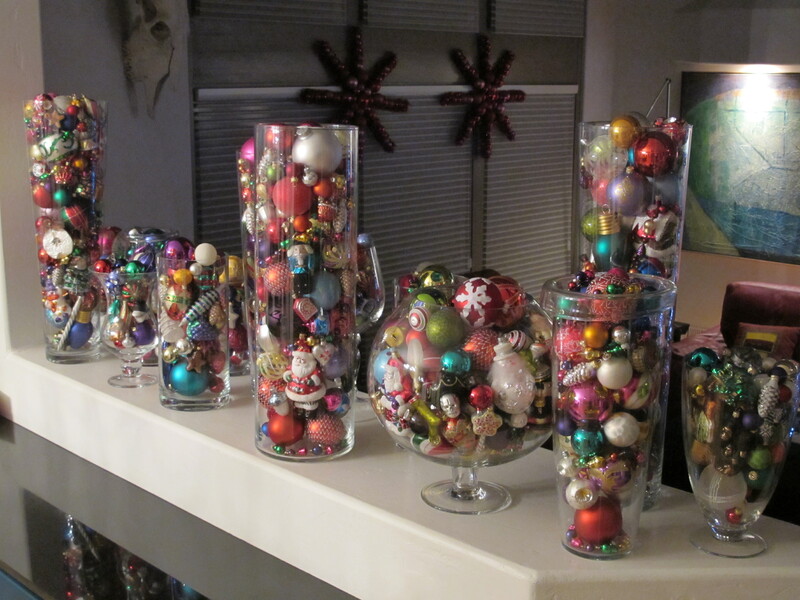 I have a number of large glass vases filled with glass ornaments. I think they look gorgeous. 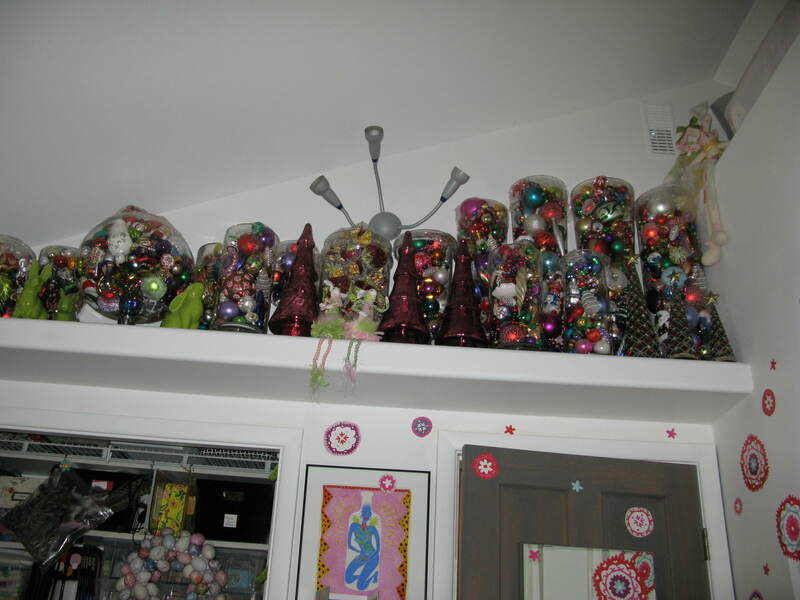 I store them, filled, so that I don’t have to fiddle with packing and unpacking all the ornaments every year. Saves time and lessens the risk of breakage. 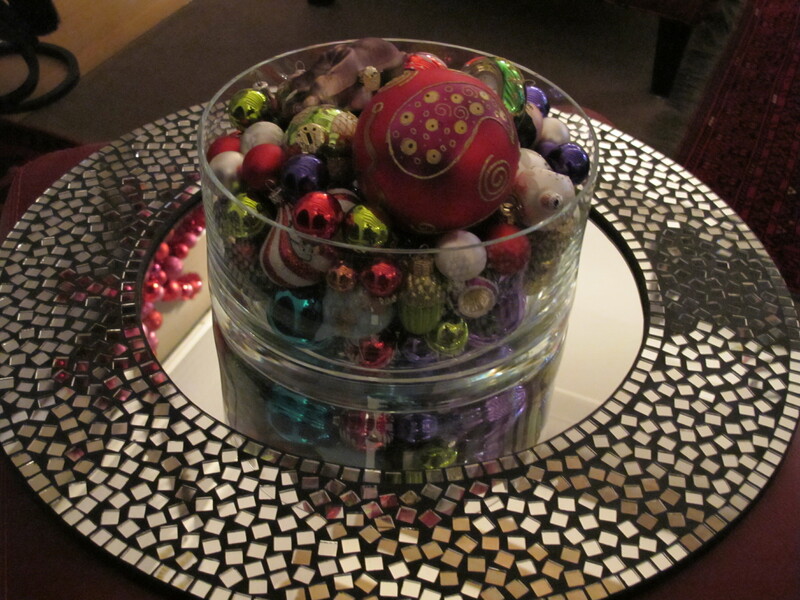 All I do is cover the vases with clear wrap to keep the ornaments clean. I had a shelf built in part of my studio to store seasonal decorations so I can enjoy the color and loveliness all year. Every 3 or 4 years I take the time to empty each vase, wash it, dry it and put the ornaments back in. Seems a small price to pay for all that glittering color. 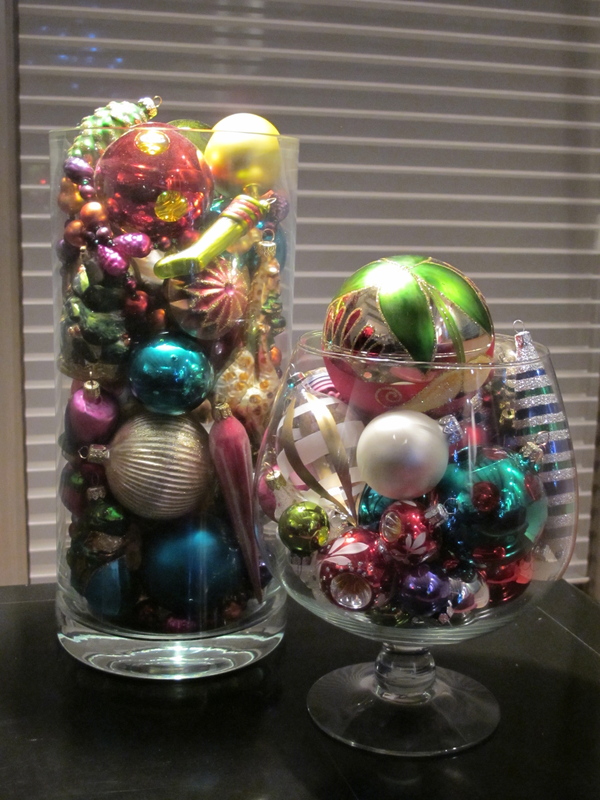 Here’s what they look like – in storage (sharing space with Easter decor) and on display. I’ll post some of my Christmas preparations and someone else can suggest where I might cut back. There must be a way. Until then I’d better get back to work. Come on girl – you know you’ll pull it off – you always do! I have the utmost faith in you. Oh – and b.t.w. – am I one of those who is getting a card instead of a cake? No pressure ……….. I miss you – any news of when to expect you? Actually – you made the short list – especially now that you’re following my blog! Your home is a place where I always feel the delight of the anticipation of Christmas – all the colour, sparkle and creativity grows that feeling of ‘waiting’ for those special days of celebration. I agree, where on earth did November disappear too? It whizzed by in a nanosecond!